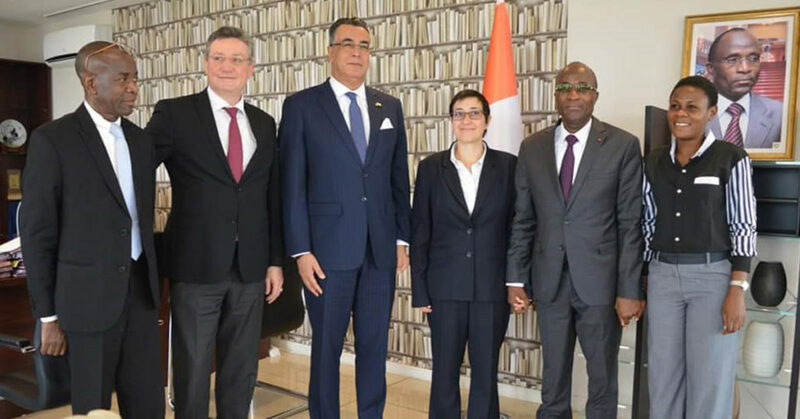 Gaia Energy have been received in an audience with the Minister of Economy and Finance of Côte d’Ivoire and the Ambassador of the Kingdom of Morocco, during the last mission organized jointly with IFC to discuss about the renewable energy program developed by IFC/Gaia platform in Ivory Coast. The Minister confirmed the importance to further strengthen the excellent relations between Morocco and Côte d’Ivoire, in particular in the field of renewable energy. From the left to the right, Mr Dao, Research Officer at Mnistry of Economy and Finance, Mr Alain Kerboriou, CEO of Gaia Energy, H.E Abdelmalek Kettani, Ambassador of Morocco in CI, Ms Orli Arav, Senior Advisor of IFC Infrastructure Africa, H.E. the Minister of Economy and Finance, Mr Adama Kone, and Ms Abelle Vah, from Gaia Energy CI.